The “next year” he mentions is 2019, as he issued this challenge at the end of 2018. We’re a month into this new year, but we still have plenty of time to pray, share the gospel, and see the impact the gospel can have on the life of even one person. While some will go and proclaim the gospel to hundreds if not thousands at the same time, all of us can be like Philip in John’s gospel—we have met Jesus, and we know someone else who needs Jesus, so we go and share with that one. Lord, place one person in my life who needs to know Jesus. Give me open eyes to see the opportunities to share as they arise, and give me boldness to tell them about Jesus and invite them to church. God’s will is that people come to faith in Jesus. Prayers like this are prayers that he delights in answering. So, who will be your one? This Sunday guest speaker George Quillin of Fairview Baptist Church speaks on the topic of God’s Magnificence from Nahum 1:2-7 while pastor Mike is out of town. Come check it out! Awana begins this Wednesday (9/9). Clubs run throughout the school year, each Wednesday school is in session, from 630-8pm. Clubs available for students from 3yo to the 12th grade. Check out the Activities page for more info. This Sunday we’ll take a look at what 1 Timothy 6 says when it comes to what we do with our wealth and finding true treasure. Then at 6pm we encourage you to check out The Life of Jesus performed by the Jesus Ballet Troupe from South Korea at our sister church: First Baptist Archie. This Sunday, we’ll take a look at what Paul wrote in 1 Thessalonians 4:13-5:11 about the return of Jesus and the hope we have because of it. Vacation Bible School also kicks off at 6pm. For more VBS info, click here. Hope to see you there! Why reflect on Jesus’ return? What do we learn about the return of Jesus? This Sunday we’ll be looking at what Paul taught about spiritual gifts in 1 Corinthians 12 and how to find our place in ministry using those gifts. Hope to see you there! Look out: what needs do you see in the church or in the community? Look in: what are your God-given passions, experiences, abilities, and resources; and how do they intersect with the needs you see? Look around: is there already a ministry in place for this? This Sunday morning, we’ll take a look at Deuteronomy 6 and “Christ and the Generations.” We’ll see how one generation of the church is to invest itself in the next generation to show them love and faithfulness to Jesus. 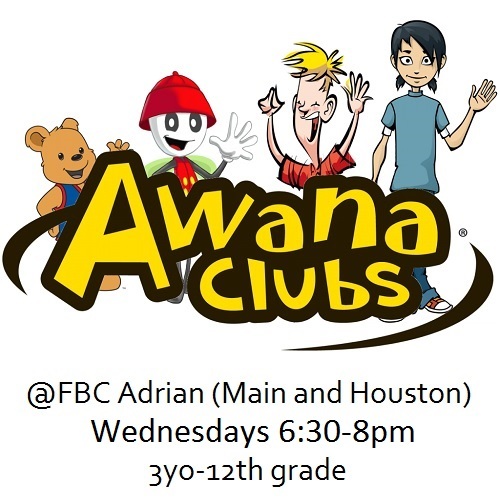 Also, Sunday evening will be our last Awana for the 2014-15 school year. We’ll celebrate with grilled hotdogs for dinner at 5pm and the year end club at 530pm. This Sunday, we’ll talk about Life as Worship (Romans 12:1-2). We also will have our Spring Dinner following our worship gathering. Meat will be provide, bring a side or a dessert (if you’re a visitor this Sunday, you’re our guest at dinner, don’t worry about brining a dish). Hope to see you there!